Unless you store your books in the heart of an Arizona desert, you probably have encountered a problem with mold and mildew at one time or another. For the record, the terms virtually are interchangeable. They both come in a variety of colors - black and off-white being the most common on books - and both cause the same sort of damage. Mold, like all fungi, grows from spores. These spores are just about everywhere, and can remain dormant a long time until conditions for growth are right. And once they are, molds waste no time in coming to life. If you've ever walked out on your lawn one morning after a warm rain the night before and seen it populated with white mushroom heads, you know how quickly molds can grow. And once they attach themselves to your books, they literally begin digesting the cloth and paper. Your precious book is their soil and, having no chlorophyll like other plants, their only source of nutrition. Because the best time to deal with mold is before it takes hold in your book collection, let's talk first about prevention. Since warmth (50-90 degrees) and moisture (60% humidity or higher) cause molds to grow, controlling these two factors is crucial. While most of us can't afford expensive dehumidifiers and temperature control devices, there are affordable alternatives. DampRid, a Calcium Chloride based product, can be found in most grocery stores. It can be put out in plastic containers and it will draw moisture out of the air. A pound is about $10 or less. The only problem with Damp-Rid is that you need to regularly and frequently empty the containers of the excess water it collects, which can be a messy chore. A better but somewhat more expensive alternative is silica gel. It can be purchased as beads and simply placed in shallow trays on shelves behind books or in display cases. The beads retain water and, when saturated, they can be dried out in your oven at 300 degrees for 3 hours and reused repeatedly. In order to know when the gel needs drying, you can add orange moisture-indicating silica gel beads that will turn clear when saturated. 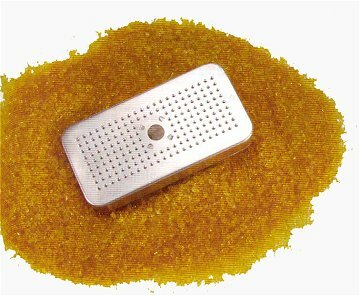 A pound of silica gel beads is about $35; the orange ones are $30 per pound. (There are also cheaper blue beads, but the orange ones are more environmentally friendly and contain no cobalt chloride.) Although any containers that can stand up to an oven's heat can be used, you can also purchase special cassettes (roughly $13 each, but as low as $9 in quantities of 10 or more) that you can fill with beads and can go from shelf to oven and back again. A humidity indicator card for about $8 is helpful in monitoring optimal humidity levels (45-55%). Any of the archival supply houses that I mentioned in my previous article will have these available for purchase. Optimally you should use one cassette of beads (roughly 8 square inches) per two cubic feet of space. If that's not possible, start by placing them where moisture is most likely to accumulate and add more as finances permit. For instance, in my bookshop I have some shelves created with brackets and braces on the walls. Air circulates freely and dampness is not a huge problem. I also have stand-alone bookshelves that are enclosed on three sides. These are more likely to hold moisture and are good candidates for being first on my list to get silica gel canisters. Air circulation is another important factor in controlling mold. 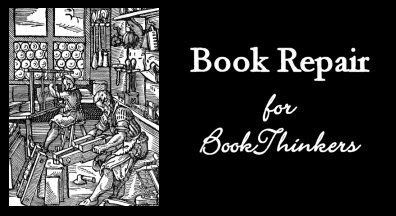 Although books shouldn't have so much room on shelves that they lean and are in danger of becoming cocked, neither should they be packed too tightly. Fans also are helpful in keeping air circulating around your book collections. Plants are pretty, but not book friendly. The damp soil that plants require and many of the containers they grow in such as wicker baskets and clay pots introduce moisture into the air and promote fungal growth. If you have a brick-and-mortar store and like the look of plants, silk ones are a good alternative (and those of us with brown thumbs can't kill them either!). Maintain good housekeeping by not accumulating items which can harbor mold or spores such as old magazines, cloth materials and so on. If you live in a humid climate, it is a good idea to wipe down room surfaces - tables, desks and shelves - with a disinfectant (such as Lysol) once a month or so. Using a vacuum cleaner, particularly one with a HEPA filter, rather than a broom or sweeper, is a good idea because dust and dirt are sources of spores both active and dormant. While a vacuum will trap spores, a broom will just help them circulate. If you have a window air conditioner or built-in A/C system, regularly inspect all vents, which are good breeding grounds for mold, and change air filters frequently. Finally, be vigilant. Check any problem areas frequently to make sure there's no mold growth. Pick several books at random and, in particular, check their gutters near the endbands and inside the spines. If you happen to buy lots of books that arrive in cartons, open them in a special "dirty area." At the Georgia State Archives they maintain a "dirty room" where new acquisitions are quarantined and checked for insects and mold and treated if necessary before being added to the stacks. Keep new books away from your collection until you know they're clean. Sometimes, no matter how careful you are, mold will attack your books. An unexpected leak will occur, your area of the country will experience a particularly rainy season, or someone will drop off a box of old books and release spores into the air before you can stop them. Whatever the circumstance, one day you see that dreaded black (or white) fuzzy stuff on your books. So how do you treat them? Vacuum cleaner, an electrostatic duster, or soft-bristled brush. Commercial disinfectant (i.e. Simple Green, Lysol, etc.). First, take the mold-infected books to a well-ventilated area. You may work outdoors or indoors, but if the latter, run an electric fan to increase air movement. Close off the room from other areas of the building, including blocking the air circulation vents if you're running an air conditioner. The last thing you want to do is blow mold spores into your collection. Your goal is to make the mold go dormant, and, when it is, it will appear dry and powdery rather than soft and fuzzy. This will allow you to remove the mold residue more easily without staining the book. One way to deal with active (fuzzy) mold is to stand the affected books on edge with the boards slightly opened so that air can blow across the pages. Rapidly moving air will dry out the moisture and desiccate the mold spores, rendering them inactive. Because ultraviolet rays from sunlight will kill mold, you also can take the books outdoors and place them in the sun and a mild breeze for a short time (not longer than an hour). When the books are dry and the mold has become powdery, a vacuum cleaner or electrostatic duster can be used to remove as much of the inactive mold as possible from the covers of the books. (In lieu of these, a soft paintbrush can be used if you must, but again, you will be scattering spores if you do so.) Dust slowly to allow the vacuum or electrostatic duster to do its job and to keep the spores from being released into the air. If using a vacuum, be especially careful around delicate books. Using a brush attachment or covering the end of the hose with cheesecloth will guard against damaging pages with too much suction. Pay particular attention to the following areas: the cover's joints, the interior of the spine, and edges of the text block. A soft-bristled brush may be used for stubborn growth. After all the mold has been brushed away, the outside of the books' covers can be wiped with a solution of ethyl alcohol. This acts as a mild solvent to remove some of the outer staining. Care must be taken not to wet the area too much. Also, if you're working with older books, test the alcohol on an inconspicuous area first. [EDITOR'S NOTE: Q-Tips work well for this because they telegraph any bleeding of color.] The dyes used in older books often are not colorfast. In these cases, you will want to dab the covers gently rather than wiping. Next, examine the insides of the books. In many cases, mold stains will be found on the inside of the binding, in or near the hinges and at the head and tail. The stains can be gently swabbed with ethyl alcohol, but it is possible that they will not be completely removed. Bleaching is not recommended, however, because bleach can cause the paper to deteriorate rapidly, especially in humid conditions. However, if staining is very bad, a cloth lightly dampened with a mild bleach solution can be used provided you follow it with plain water and take care not to make the book wet. Before returning books to their shelves, make sure that you thoroughly clean the shelves with Lysol or other disinfectant and that the area is completely dry. It might also be helpful to keep a record of where the problem areas were for future reference. Next time I'll address a related problem - how to salvage a wet book - and also cover several other cosmetic fixes.